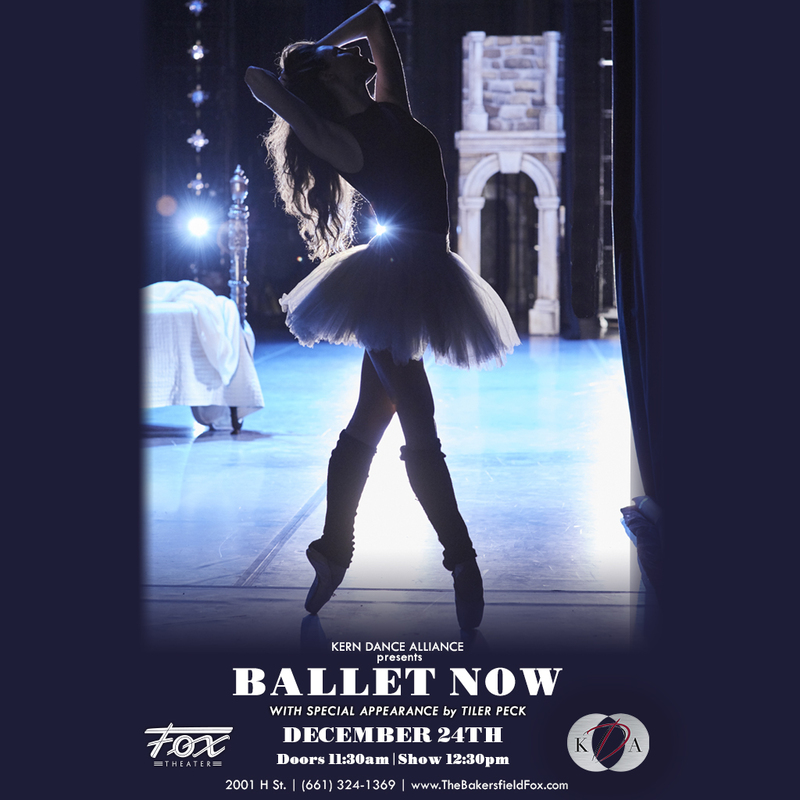 Kern Dance Alliance is pleased to present Ballet NOW, a Hulu documentary featuring internationally recognized ballerina and Bakersfield native, Tiler Peck, at the Bakersfield Fox Theater on December 24, 2018 at 12:30 pm. Ms. Peck will attend this special event by participating in the screening, a live Q&A on stage, and an autograph signing. Ballet Now provides a rarely seen, unfiltered glimpse into the world of ballet and what it takes to create a one-of-kind dance extravaganza. Featuring New York City Ballet’s Prima Ballerina Tiler Peck – the first ever woman to be asked to curate The Music Center’s famed Ballet NOW program – and a diverse cast of world-class dancers from around the globe, the film follows Tiler as she tries to execute her groundbreaking vision of mashing together the worlds of tap, hip-hop, ballet and even clown artistry. With less than a week to pull it all off, Tiler faces the mounting pressures of not only dancing in multiple pieces, but also producing and directing this high profile event. The success of the performances rests squarely on her shoulders. Will she pull it off? Ballet NOW is directed by Oscar nominated and Emmy award winner, Steven Cantor, and produced by Emmy and Golden Globe winner, Elisabeth Moss. Ballet NOW has been screened at the Nantucket Film Festival, Seattle International Film Festival and launched on Hulu in July 2018. Ballet NOW is made possible by Vulcan Productions and Stick Figure Studios. The screening of Ballet NOW at the Fox Theater on Christmas Eve also happens to be the 88th birthday of the historic theater. The Fox has presented exciting entertainment for decades, including the likes of Bakersfield’s very own Buck Owen and Merle Haggard. Whether ballet, country music, comedians, or Chinese flying acrobats, the Fox takes pride in showcasing extraordinary talents. “The Fox Theater opened on Christmas Eve in 1930 as Bakersfield’s movie house. 88 years later, we are celebrating Lady Fox by viewing a movie about a Bakersfield dancer- how appropriate!” Andrea Hansen, Kern Dance Alliance President and Fox Theater Board Member. Tickets are pre-sold at $5 and are $8 day of the event. Kern Dance Alliance members receive free admission. Dancers are encouraged to bring their dance shoes to the autograph signing and come prepared for questions to ask Ms. Peck. For more information and to purchase tickets-www.TheBakersfieldFox.com.